What would our cities look like if they had been built with a different scale in mind? 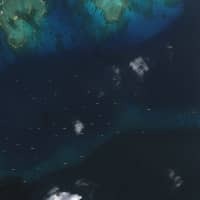 What if we considered building structures for creatures other than humans? 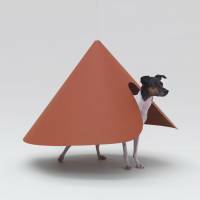 “Architecture for Dogs” explores that idea with an exhibition of 13 architectural works made for specific canine breeds. 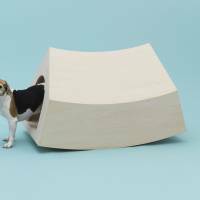 After debuting at Design Miami in 2012, and traveling to the Museum of Modern Art, Los Angeles, “Architecture for Dogs” is now showing at Toto’s Gallery Ma in Aoyama, Tokyo, with a selection of new pieces created by the Hara Design Institute. 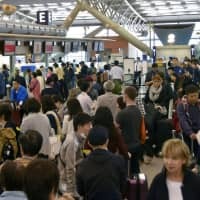 During the late 1980s, Kenya Hara, art director for Ryohin Keikaku Co.,Ltd’s Muji brand, became fascinated with the idea that the built environment is “predicated on a human scale” leading him to wonder what architecture at a non-human scale might involve. 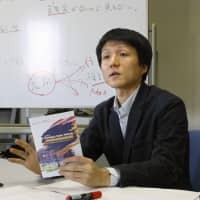 He chose dogs as a starting point because “practically everybody on Earth is familiar with dogs and has some interest in them,” he says in the opening essay to the “Architecture for Dogs” catalog. And that sums it up: People like dogs. 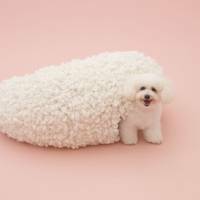 Hara also participated in the production of “D-tunnel” for a Teacup Poodle: a small structure with a staircase leading up to a tiny precipice where the small poodle can sit at the eye level of a human sitting on a chair. The second floor of Gallery Ma is dedicated to new variations on the “D-tunnel” produced by Hara and his Design Institute. The space is filled with small models, three dog-scale versions and some slick videos of dogs using the structures. It’s a simple way to physically equalize the dog-human hierarchy. 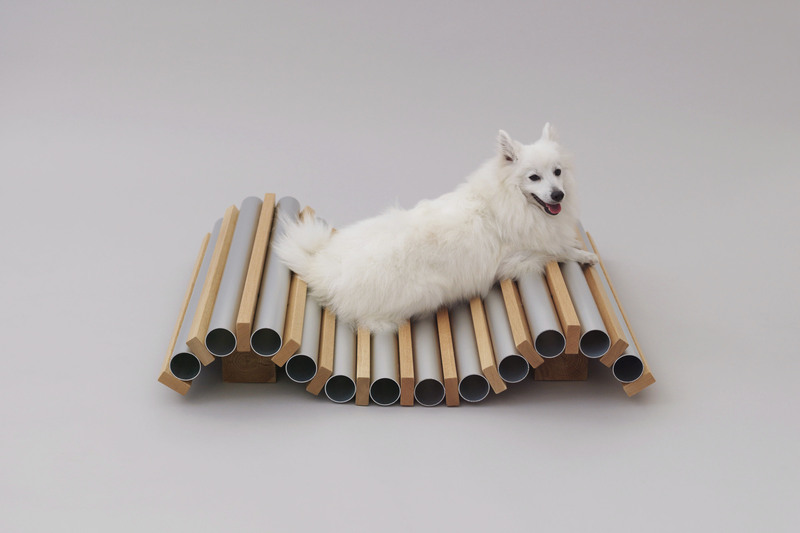 Artelier Bow Wow also explores this idea of dogs “meeting their masters’ eyes,” though slightly differently by producing the “Architecture For Long-bodied-short-legged Dog”, a long modular wooden structure for a smooth-haired Dachshund. Other participants focus on giving dogs the kind of comforts we humans take for granted: mobility for the disabled or cooling spaces in summer. Toyo Ito initially proposed a balloon that floats beside a dog to carry its things, but later designed a mobile dog home, a low wooden and wheeled basket, which has become a favorite of visitors and captures many of Hara’s ideas. 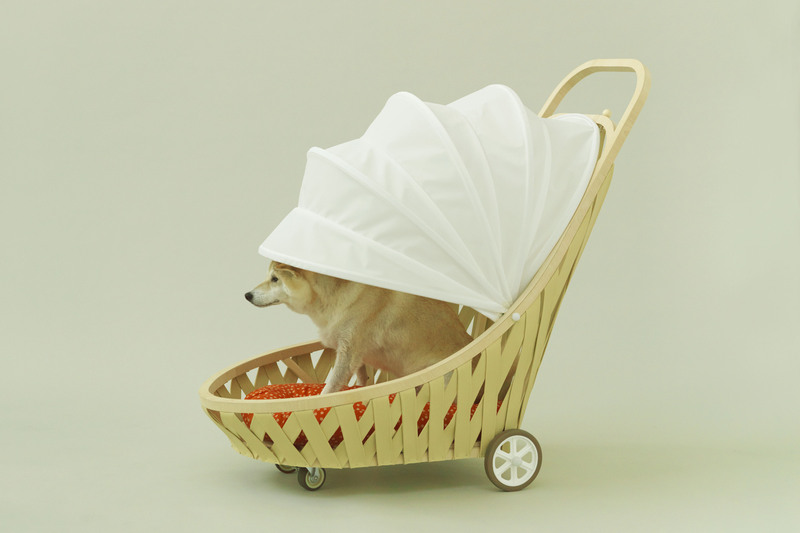 This “Mobile Home for Shiba” elegantly solves the problem of how to walk Momochan, Ito’s dog, when she gets old. “This is really great, really Japanese, really cute,” said two men looking over the vehicle, on a recent rainy Saturday in Gallery Ma. Nearby is Hiroshi Naito’s aluminium tubular system, which can be filled with bagged ice, to cool down dogs during hot days. 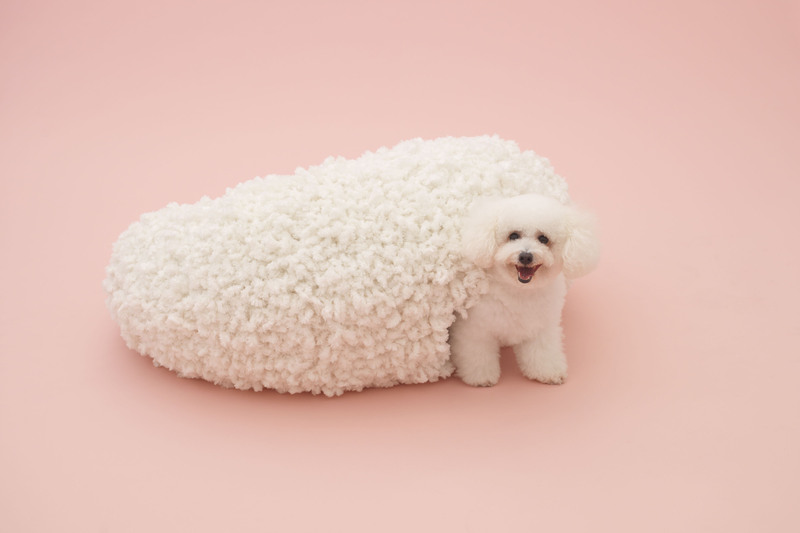 Kazuyo Sejima from 2010 Pritzker Prize-winning Tokyo firm SANAA, produced a hollow circular plywood frame with a cover knitted in soft white material that resembles the coat of the dog it’s designed for, the Bichon Frise. 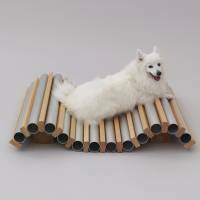 As the dog enters, or sits on top of the circular ring, “dog and architecture become one,” Sejima is quoted saying in the catalog. Sou Foujimoto did make a cage, but merged it with a bookshelf filled with objects, to give it some warmth. 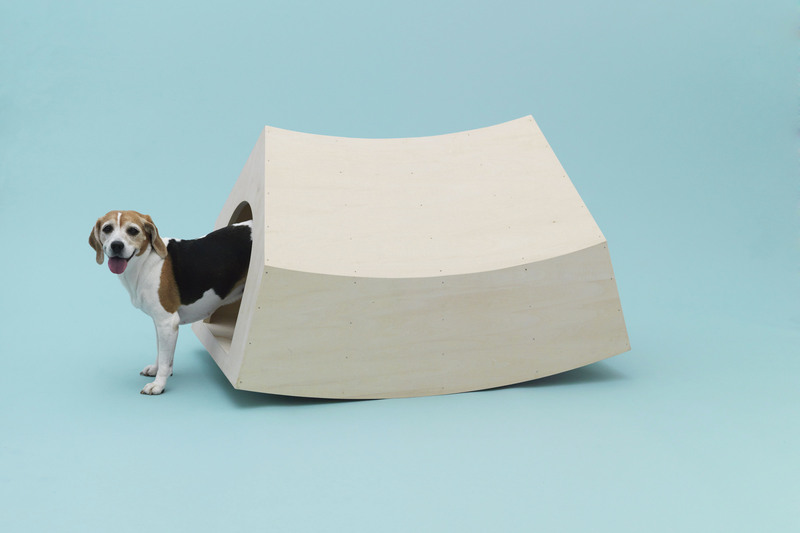 In an interview in the catalog, he explains that “Architecture for Dogs” reveals “how each architect perceives architecture, rather than how we each perceive dogs.” Foujimoto’s doghouse/bookshelf is an iteration of the huge white wire-framed blob he made for the 2013 Serpentine Gallery Pavilion in London. While that space worked brilliantly, the same technique isn’t as profound here. It’s an interesting idea, but cold. Kengo Kuma’s contemporary monument to the pug, “Mount Pug” falls into similar territory. 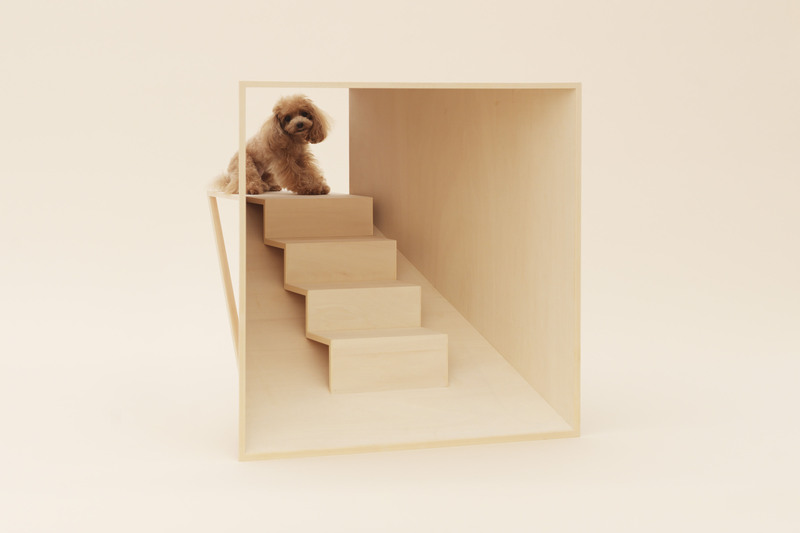 It’s a stackable system, a nail-free wooden “mountain” for a Pug to play in or sleep beneath. 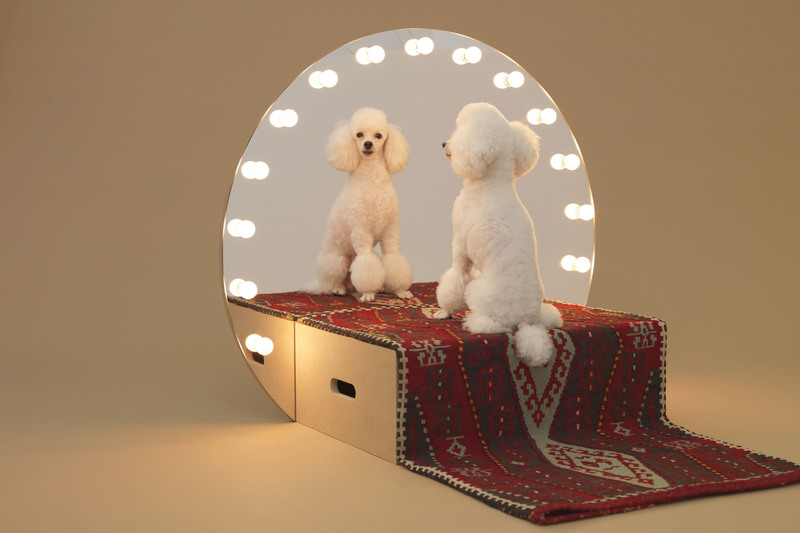 Other examples are more comical, such as Netherlands-based MVRDV, who made a rocking kennel for a Beagle, or industrial designer Konstantin Grcic’s “Paramount” vanity stage for a Toy Poodle, which includes a small patterned rug leading up to a circular mirror lined with lights. His reasoning being that poodles are supposedly one of the few dogs that can recognize themselves in a mirror. It’s not just about the structures, the website www.architecturefordogs.com, designed by Tokyo-based Yugo Nakamura, is an integral part of the exhibition, and features free downloadable blueprints of every design in the collection and instructions on how to build them. 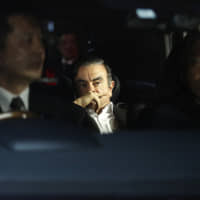 Although this was supposed to be the final stop for the traveling exhibition, Hara now has plans to take “Architecture for Dogs” to South Korea, Asia, Europe and back to America. Perhaps it’s not soon enough, though. 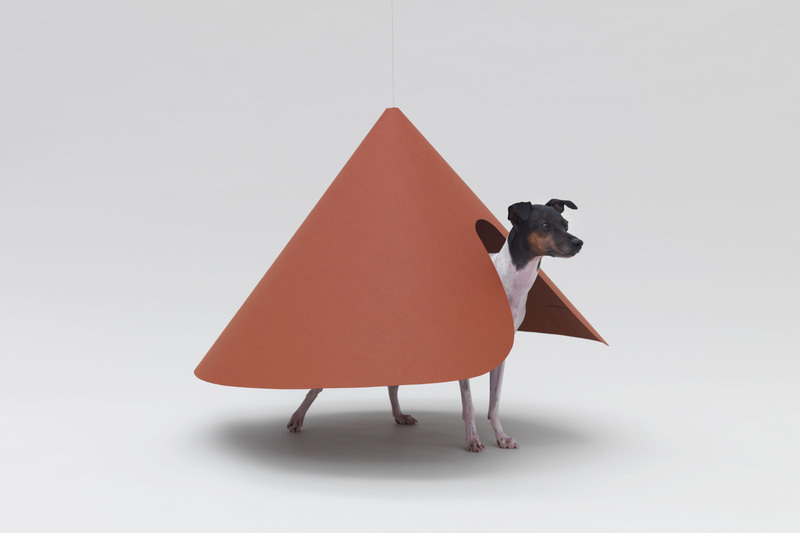 It appears the idea is so good, it’s been copied already — surely the most frustrating form of flattery in a consumer age — by a Mexican group of 10 architects, who in August branded their show “Dogchitecture.” Without Hara’s theoretical framework and free downloadable blueprints, however, the works in “Dogchitecture” look like confusing sculptures for out-of-touch dog lovers; examples that show how narrowly Hara’s project missed a similar fate.